For the past few years, Sophia and Olivia have been learning about different countries around the world alphabetically. We started with Australia, Brazil, and China; and now have ended with Yemen and Zambia. 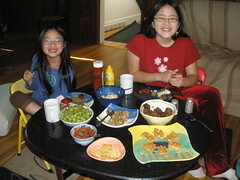 One of the girls’ favorite ways to learn about other countries is through food. I found recipes for each of the countries we studied, we shopped for the ingredients, prepared the food, and then ate what we made. Sometimes the food was incredibly good, and we all wanted to make the recipe again. Other times…well…let’s just say that those were educational and culinary experiences. This month we finished this multi-year world geography unit study by focusing on Yemen and Zambia. Each had food that we would definitely make again. I couldn’t find many recipes for Yemen on the internet. However, I did find one for Yemenite Eggplant Salad. There is one ingredient in the Eggplant Salad, zhoug, which has many of the same ingredients as salsa (e.g., cilantro, chilies, garlic). Zhoug’s base isn’t tomatoes (like it is with salsa), but one of the main ingredients in Yemenite Eggplant Salad is tomatoes, so it was a less expensive and readily-available substitute. Although the recipe calls it a salad, it looks more like a dip. So, we placed some of the salad on the wheat crackers instead. 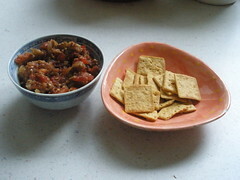 The eggplant salad is very spicy. Sophia and I liked it, but Olivia can’t even handle mild salsa, so this would have been way too spicy for her to enjoy. She did taste a little, though; and then was barely able to utter “HOT!” before following it with quite a bit of water. With one tablespoon of black pepper…it certainly was hot. Bake the eggplant until it is very soft, about 35 minutes. Peel and cool. mash the eggplant pulp and mix with the chopped tomato. Add the rest of the ingredients and mix well. Moving from the Middle East to Africa, we came to Zambia. 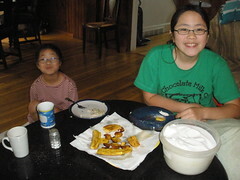 One of the recipes we tried, both the girls would enjoy having again (uchi bars); one I liked (sweet potato snacks); and one was an interesting experience with trying a new food (fried plantains). Melt sugar and honey together on the stove until sugar is completely dissolved. Take off heat and mix peanut butter into the mixture. Gradually add the nuts and cereal, alternating, until all dry ingredients are thoroughly mixed. 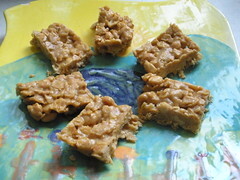 Spread the mixture into a greased 9 1/2 x 11 inch pan and place in the refrigerator until hard. Note: Although this recipe came from a Zambian website, I think it was promoting its Zambian Gold honey…so this may not be totally representative of Zambian food. Peel sweet potatoes and grate or cut into very thin slices (Sophia grated them). Chop coriander leaves, onions and chilies fine. Add salt, coriander leaves, onion, chilies and a little flour to sweet potatoes and mix well. 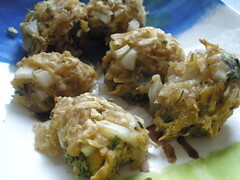 Shape into small round balls and deep-fry in oil. Serve warm. Note: To make the sweet potato balls healthier, we baked them in a 400 degree oven until they were cooked through and the potato part was soft. Peel and cut plantains, either into thin slices, or slice each plantain in half and cut each half lengthwise. have no flavor when we tasted it raw. Heat the oil in a pan or skillet on the stove top. 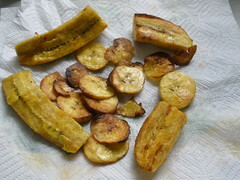 Add plantains (in a single layer) and fry until golden. We all liked the thin slices versus longer halves. The thinner the slice, the more they tasted like potato chips. The slices tasted like french fries. The girls trying fried plantains. We tried it first with sugar (no one liked that). Then we tried them with salt (much better). They tasted like french fries and potato chips.